Freeport-McMoRan, B2Gold, Kinross Gold, and Sibanye Gold are all off to an auspicious start in the new year. Climbing nearly 6% through January, the price of gold outpaced the meager gain -- nearly 1% -- of the S&P 500. Unsurprisingly, many of the market's largest gold stocks enjoyed double-digit gains, including Freeport-McMoRan (NYSE:FCX), B2Gold (NYSEMKT:BTG), Kinross Gold (NYSE:KGC), and Sibanye Gold (NYSE:SBGL). Selling 1.1 million ounces of gold in fiscal 2016, Freeport-McMoRan has a strong presence in the gold market, but the company is also a major player in the copper market. With seven mines in North America, two mines in South America, and one gold-copper mine in Indonesia, Freeport-McMoRan says it's the largest publicly traded copper producer, reporting 4.65 billion pounds of copper production in fiscal 2016. 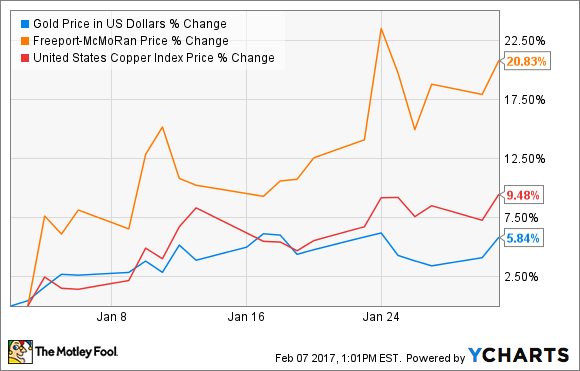 One reason for Freeport-McMoRan's 21% rise through January is the rise in the price of copper, which jumped over 9% in the month. Also contributing to the stock's rise is the market's reaction to the company's release of its fiscal 2016 earnings. Executing its debt-reduction strategy, the company paid off $4.5 billion through the year, reducing its net debt to $11.8 billion -- a 41.5% reduction over fiscal 2015. Yet another factor is the company's bullish forecast. For fiscal 2016, the company reported $3.7 billion in operating cash flow, but management estimates this figure to grow to $4.3 billion for fiscal 2017. With four producing gold mines, B2Gold is an intermediate gold producer; however, it also has three mines in development and seven in the exploration phase. Although the company didn't report any specific developments during the month, investors -- driving the stock up 21% -- were probably responding to the rise in the price of gold and an optimistic corporate presentation. Acknowledging strong performance from its its Masbate, Otjikoto, and Libertad Mines, management forecast a record year of gold production for fiscal 2016 -- approximately 13% higher than that which it reported in fiscal 2015. Management also indicated that B2Gold would report lower all-in sustaining costs (AISC) for the year. Whereas it reported AISC of $947 per gold ounce in 2015, the company is estimating AISC to total between $780 and $810 per gold ounce for 2016 -- a substantial downward revision from the $895- to $925-per-ounce range, which it had provided earlier in the year. Other than one platinum-producing mine in Zimbabwe, all of Sibanye Gold's other operations are located in South Africa -- four gold-producing mines and three platinum-producing mines. This is set to change, though, with its acquisition of Stillwater Mining, which is expected to close in the second quarter of 2017. Operating two mines in Montana, Stillwater Mining is one of the largest producers of palladium and platinum in the United States. One factor surely contributing to the stock's rise in January was news that the acquisition of Stillwater had cleared a major hurdle, for the deal was subject to antitrust conditions under the Hart-Scott-Rodino Antitrust Improvements Act. Sibanye reported in a press release that U.S. regulators approved the deal. According to management, "[T]he antitrust condition required for the Transaction has now been satisfied." In all likelihood, shares also climbed through January as a result of both the rise in the price of gold and the rise in the prices of palladium, which reached a 22-month high during the month. Operating five mines in the Americas, two mines in Africa, and two mines in Russia, Kinross is a pure play on gold. Investors are still waiting for the company to report its fiscal 2016 earnings, but two corporate presentations in January pleased investors enough to drive shares up more than 18%. Providing preliminary results, management estimated annual gold production of between 2.7 million and 2.9 million gold ounces for fiscal 2016 -- an improvement over the 2.6 million it reported in fiscal 2015. The company is also optimistic that it will report a reduction in costs for the year. Management estimates AISC between $890 to $990 per gold ounce for fiscal 2016; AISC for fiscal 2015 totaled $975 per gold ounce. Looking to the year ahead, management reiterated its expectation that it will complete a mineral reserve estimate in Q1, which has the potential to double the current proven and probable reserves at the Bald Mountain mine -- a mine that has the potential to emerge as one of the company's lifelong mines. Many gold-mining stocks enjoyed plentiful gains in 2016 -- gains that have extended into the new year. Of course, no one knows for sure what the coming months will bring, but having a good understanding of what drove the stocks' gains in January will help provide insight into similar events in the months to come.